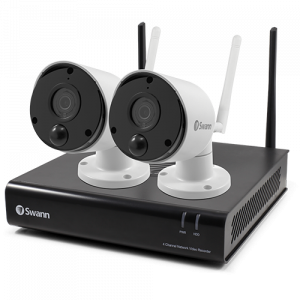 GuardianEye Replacement / 4 Channel Wi-Fi HD Monitoring System / 2 x 1080p Wireless IP Camera / Day & night vision with built-in cut IR filters / Record to massive 1TB Hard Drive / Add 2 more cameras for extra protection The easiest way to know your family is safe! 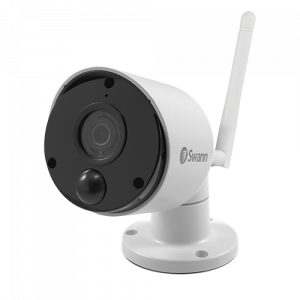 With a Swann Wi-Fi security system connect your security cameras to a recorder or app to monitor your property from anywhere. Find a range of Wi-Fi enabled security system including indoor and outdoor security cameras with a recorder as well as standalone Wi-Fi & IP cameras. Every Wi-Fi security camera system comes with remote monitoring through our free app, so you can check-in from anywhere, anytime. 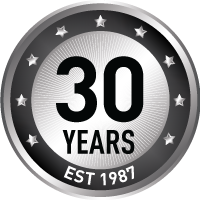 With over 30 years in home security, we know what matters most. That’s why every Swann product includes a 12-month warranty and an online support community. 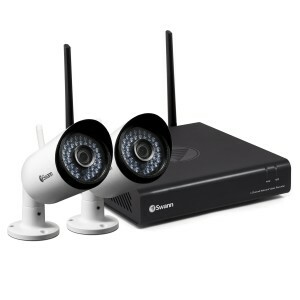 Find the perfect Wi-Fi security system for your property today!